On Wednesday 28 June, four students from Koru 3 traveled into the city to meet Children's Commissioner, Judge Andrew Becroft and share their ideas for the residential red zone. Earlier this term Sian from Regenerate Christchurch contacted us to invite some students to a very special meeting with the Children's Commissioner of New Zealand, Judge Andrew Becroft. Sian and the team at Regenerate Christchurch recognised the effort and creativity that our Koru students had shown in their letters and models (as part of our 'Regenerating the Red Zone' inquiry) and were thrilled when we accepted their invitation. Selecting only four students was very difficult for the Koru 3 teachers as there were many children who had thought of interesting and creative ideas. The teachers decided to invite Cole, Wyatt, Zeke and Zach to represent our team. As the day approached, Mrs Togiaso began to work with the boys to put together their presentation. We knew there would be other schools presenting on the day and wondered what types of ideas they would have and how they would present their ideas to Judge Becroft. The team worked together to decide what things would make a good presentation. We thought our persuasive letters were interesting and decided to include a couple of these in our presentation. We also knew that we had created some really awesome models and were keen to use these in our presentation. On the Friday before the presentation Mrs Togiaso came in and worked with the group to put together a plan for the presentation. We decided we would each have a turn at speaking and that some of us would read out the letters while the others would share their models. We then sorted out what we would say and decided that our presentation would be better if we tried to memorise our key points instead of reading a speech off an iPad or piece of paper. We came up with what we wanted to say and Mrs Togiaso wrote it down so we could take it home and practice. The day before our presentation we spent the afternoon organising the order we would speak and practicing our speeches. At the end of the day, we practiced in front of the Green home group and they gave us feedback on what we did well and areas we could improve. Our home group were really supportive and lots of people gave us words of encouragement as they knew we were feeling a bit nervous. Joscelyn was really kind and said she felt really proud having us represent our team and that the team were all behind us 100%. These comments made us feel really good and proud to be part of Koru 3. Finally the big day arrived! As we were walking through the senior playground on our way to Mrs Togiaso's car, lots of our classmates gave us high fives and said really encouraging words which was awesome! Once we arrived at the Regenerate Christchurch office we headed up the lift to Level 2 and signed in. We then walked in and took a seat at a massive boardroom table. When all of the schools had arrived, the CEO of Regenerate Christchurch, Ivan Iafeta, welcomed us and introduced Judge Becroft. Then the presentations began. We were last to present and were happy to sit back and listen to the other schools' presentations (Banks Avenue School, Wāitakiri School and Haeata Community Campus). Then it was our turn. We all felt a bit nervous but really excited as we walked up to the front of the room. Once we were ready we began our presentation. After the presentation we stayed up the front of the room for almost 5 minutes as lots of the children from the other schools and Judge Becroft commented on our presentation. We were told from a number of people that they really enjoyed our presentation because we had lots of different and interesting things (e.g. letters, photos, models). We also had a number of comments on how creative our models were and how much effort we must have put into both our models and letters. 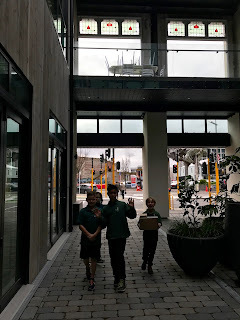 Judge Becroft told us our ideas were really well thought out and Chris Mene (Regenerate Christchurch) asked Wyatt a few questions about building a Samoan fale in the red zone. At the end of the presentation Judge Becroft gave us each a special certificate from the Children's Commission and Sian presented us with a native plant for our school. To top off this awesome experience, we then got to have a delicious afternoon tea and hang out with the children from the other schools. On the way home, we were all really happy and proud of our fantastic presentation. Mrs Togiaso was also really proud of our team and of all the effort we had put in. This was an amazing experience for our tamariki and demonstrated that our voices are powerful and that our opinions and ideas are important and have value. Well done boys for doing a fantastic job of representing our Koru 3 team.